DECORAPORT 36 x 36 In LED Bathroom Silvered Mirror with Touch Button, application of 0.2 in. float glass, LED light source, safe and energy-efficient. The lighted mirror with silvered reflection layer, guarantees clear and real phantom, top and back lacquers, environmental and waterproof. -Easy to install. Our LED mirror is hardwired. Tips: Please cut off the power when you connect the wires. – Item Length: 2.0 In. – Item Width: 36.0 In. – Item Height: 36.0 In. – Item Weight: 26 Lbs. We will pack the mirror with strong material, but because this type of item is fragile, if it is broken unfortunately when it arrived, please contact us as soon as possible firstly and send us some pictures of the broken mirror and the original package. After receiving these pictures, we will offer you a best solution as soon as possible. 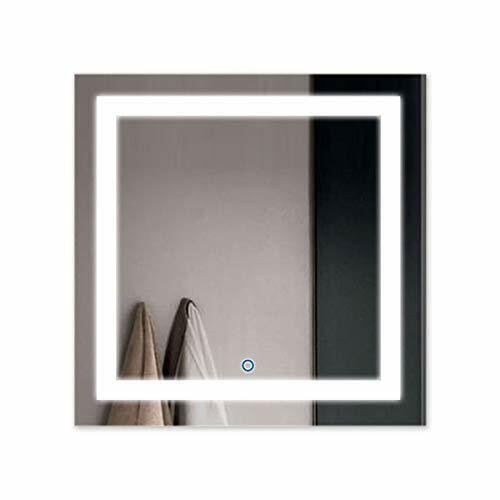 This entry was posted in square wall mirror and tagged 36“, ACK168E, Bathroom, Button, DECORAPORT, Illuminated, Lighted, mirror, Mounted, Square, Touch, Vanity, wall.